Guests are enchanted by this traditional Portuguese manor house, surrounded by luxuriant and mature gardens, a splendid swimming pool and invigorating tennis courts. Ground Floor: Living and Dining room with TV, DVD, CD, video and fireplace. Secondary dining room. Guest Cloakroom. Games room with snooker table with door to terrace. Full equipped kitchen (dishwasher, microwave, oven, fridge, and freezer). Laundry room (washing machine). First floor: Sitting room with open views. 6 Bedrooms (4 doubles and 2 twins), all with en suite bathrooms. Outside: Gardens. Kiwi's orchard. Private Tennis Court. In-built barbecue. Poolside shower. Private parking. Pool room with cloakrooms. 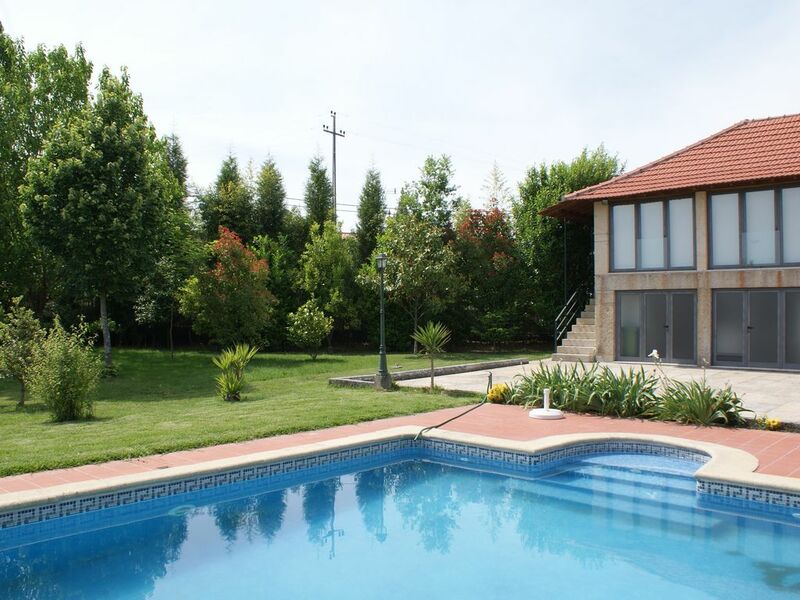 Private swimming pool (10m x 5m) with Roman steps surrounded by lawns.